On Independence Day, the 4th of July, I was sitting in the kitchen of my parents’ house drinking some coffee and sharing some homemade pancakes with Desi while my mother talked to my aunt on the phone about plans to meet at the Saugerties 4th of July parade. After hanging up my mother mentioned, offhand, that my aunt had a pile of young Wild Turkeys in her yard. At that point I did what any birder would do in such a situation. I called my aunt back, who confirmed the turkeys were still there, made sure Desi had eaten enough pancakes, and then I took the short drive to my Aunt Bonnie’s house to see some Wild Turkeys. 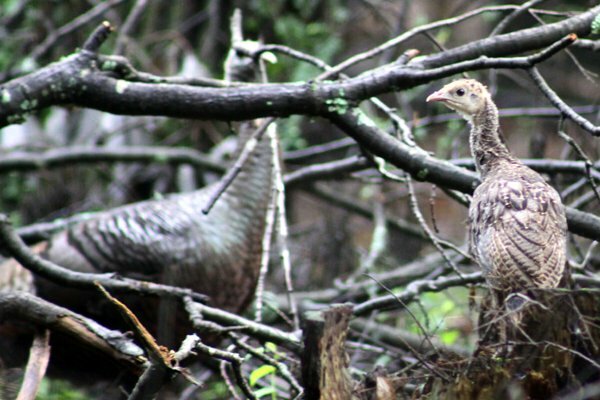 Why was I interested in Wild Turkeys on the 4th of July? Because they could have become the national bird of the United States, and would have if Benjamin Franklin had his way, and I thought it would somehow be patriotic or something to pay homage to turkeys on this holiday instead of the turkey holocaust that is Thanksgiving. That and turkeys are just plain cool, especially when you get to see a whole bunch of them at once. Unfortunately for me these turkeys were a bit wary for birds that had bedded down in a front yard and I had to work to get any usable shots after they skedaddled into the well shaded woods. But after my turkey encounter, and after stopping to say hello to my aunt and grandmother, I started to think that it is a darn good thing that the Wild Turkey is not the national bird of the United States. This thought was only reinforced when later that morning I went to my hometown 4th of July Parade. 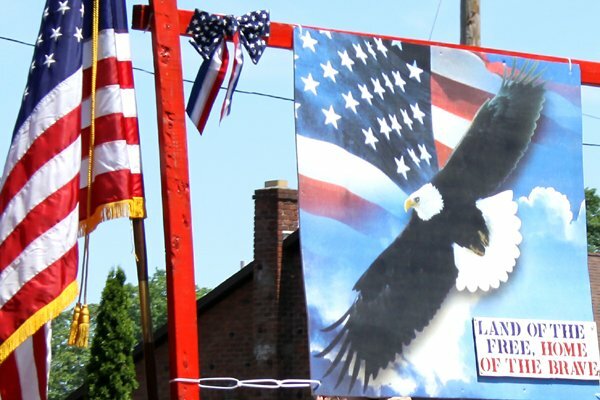 You see, Americans are very big on their national bird and they put its image everywhere, in not at all tacky displays of jingoism and patriotism. And as bad as some of these images are when a Bald Eagle is used I can’t even imagine what they would look like with turkeys. A couple of actually not too bad examples from the parade are below. If you want to see how bad things can get just image search “Bald Eagle American flag” and enjoy the rewards. Be thankful that Benjamin Franklin did not get his way or you would be picking eagle out of your teeth each year, that is, if you managed to survive the onslaught of patriotic turkey pictures every time someone wanted to rally ’round the flag. Think of the movies and commercials that would feature a flying turkey accompanied by a Red-tailed Hawk call! And Colbert would have to open his show with a flapping turkey. I wonder what the mercury content of Bald Eagle breast meat is. What annoys me about the “land of the free, home of the brave” is that the slogan suggests I am an oppressed coward here in Germany. Oh well. @David: Sorry you got stood up in Texas, but if you’re ever in NY let me know — every day the turkeys file past my parents’ house like clockwork! Mediterranean Gull – Coming to a Coast Near You Soon? Where Are You Birding This Final Weekend of July 2018? Where Are You Birding This Third Weekend of July 2018? Where Are You Birding This Second Weekend of July 2018?